Stopping smoking is certainly not the easiest thing to do but it is a vital part of getting fit and healthy and keeping your family fit and healthy as well. Every cigarette a person smokes will impact on their health and the health of those around them. In an indirect way cigarettes will also prevent people from getting fit by doing more exercise, as smoking will prevent a person from exercising to the best of their ability. Passive smoking is well-documented these days and it seems that most people are aware of the dangers. However, there are still people who persist in smoking around others. The worst part of this is that those others are often children who have no say in the matter and cannot move away from the cigarette smoke. 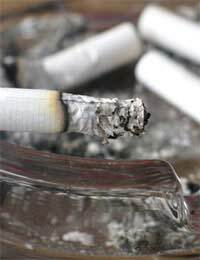 The abolition of smoking in workplaces, bars and restaurants across the UK has gone some way to stopping passive smoking but it still remains a problem where people smoke in their own homes. If they smoke in front of others it means that those others are inhaling the toxins which they are breathing out, and thus, taking on some of the effects of smoking themselves. There is no definitive way to stop smoking as everyone is different. Some people find they can stop just by using willpower alone. But others find that they need help. The key thing is to remember that smoking is addictive and if you cannot stop by willpower alone, it is not a slight on you, as your body may well have become dependent on the nicotine which is contained in cigarettes. One of the most popular ways of stopping smoking is to use some form of nicotine substitute while you wean your body off the toxin. This can include the use of nicotine gum and nicotine patches. These devices allow some nicotine into the blood stream and you can use less and less as you become less addicted to the nicotine until you can stop using them altogether. Other people need a little more help. Hypnotherapy has proved very useful for some people who simply cannot stop smoking on their own. This involves one or two sessions with a therapist, usually at their clinic, where they will change the way your mind works in relation to cigarettes. This does not work for everyone but some results suggest people can go from being a heavy smoker to not smoking at all with the use of hypnotherapy. There is no cut and dried answer to the problem of stopping smoking. Many people want to stop but simply cannot. Others have tried before and not succeeded so do not think it is any more worth their while. And some people simply do not want to give up. But for a fit and healthy life, it is simply imperative that cigarettes vanish from your life. If the health benefits alone are not enough – cutting the risk of lung cancer, emphysema, asthma, heart disease, stroke – then surely the cost must be a contributing factor. Cigarettes are expensive, so try saving all the money you would have spent on them and using it for a treat – you may be slightly surprised by quite how much you can afford. Questionnaire: Am I at Risk of Health Problems?